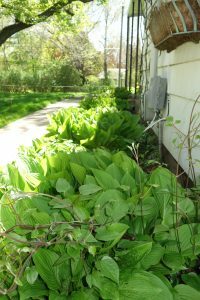 About 15 years ago, MaryJo and Charlie Skemp started noticing unusual activity in a hosta planting that runs along the back side of their home. 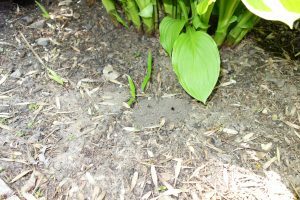 Beginning each spring, the garden would become an energy-filled flurry of what appeared to be bees, or perhaps wasps or hornets, hurriedly flying in and out of anthill-like holes in the ground. 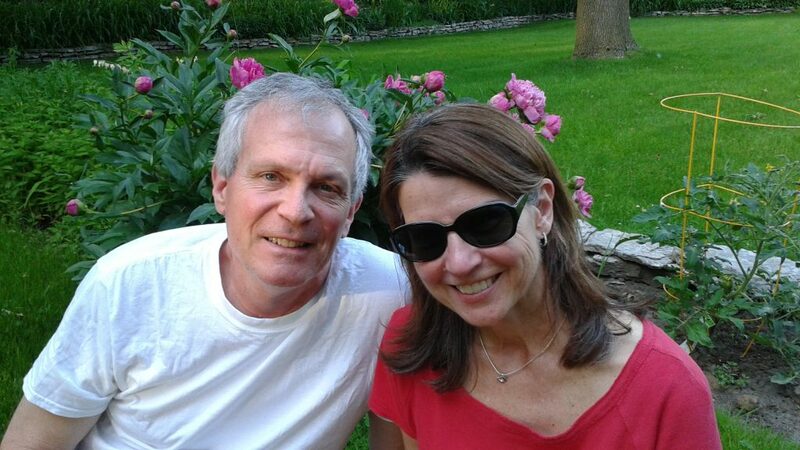 “Accidental beekeepers,” MaryJo and Charlie Skemp, in their backyard garden. “We had no idea what these insects were,” recalls MaryJo, who grew up in West St. Paul and has been an elementary school teacher in School District 197 for over 30 years. While the insects were never bothersome, Charlie and MaryJo nonetheless had an exterminator make a visit to their home after their daughter Laura was stung one year. They were told ground-nesting bees had made their nests in the perfect conditions—exposed bare soil—that existed on the side of the house. 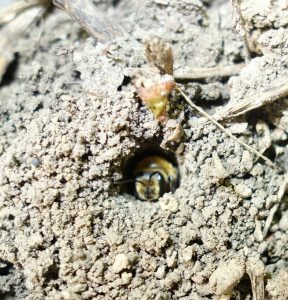 The mining bee makes its nest in sandy soils. This bee seems to be waiting for the photographer to leave before making its exit. While living side-by-side with ground-nesting bees may not be for everyone, the Skemps have been surprised at how uninterested the bees are in them. Minnesota is home to over 400 species of native bees—70 percent of which build their nests underground. Minnesota ground nesting bees include species of mining, cellophane, sweat, digger, and long-horned bees. All are important pollinators. These unassertive creatures can sting if they feel physically threatened, but it takes a lot to get them agitated. Some of the ground nesting bees’ stings, such as the mining bee, often do not even penetrate human skin. Because habitat loss and other environmental stressors threaten many species of bees in Minnesota, as well as around the world, homeowners interested in inviting ground-nesting bees into low traffic areas of their yards are encouraged to keep some areas of exposed bare soil in the yard or garden and offer ground-nesting bees some of their favorite nectar and pollen flowers. The insects flying near the Skemps’ home might have turned out to be yellow jackets, which often make their nests in the cavity of an old mouse hole, as well as insects other than bees. However, the signature anthill-like mounds with larger than ant-sized holes, combined with the bees appearing in the same place each year, and their gentle nature, provided clues that they were native mining bees and not wasps. At first glance these may appear to be anthills. However, the larger holes indicate a native bee has likely made its nest below. predator, and have their own important place in our ecosystem. 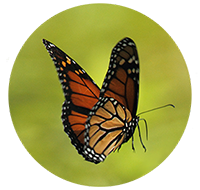 The University of Minnesota offers further information on wasps and bees, safety considerations, habitat, and options for removal or coexistence. The Cariveau Native Bee Lab at the University of Minnesota is also an excellent resource for any homeowners interested in better understanding what type of native bees may be in their yard. While the Skemps aren’t really “beekeepers,” because native bees aren’t managed (unlike non-native honeybees that are managed in hives), they are doing their important part in helping wild bees stay wild. Offering a safe zone so that the bees can emerge each year for a few weeks indeed makes the Skemps the keepers of bees. A view of the Skemp’s hosta garden. A safe haven for native bees for 15 years. Wildlife thrives where it has suitable habitat.